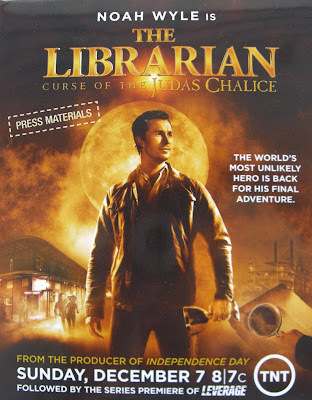 The Librarian: Curse of the Judas Chalice is the third in The Librarian franchise of movies starring Noah Wyle as a librarian who protects a secret collection of artifacts. It is a sequel to 2004's The Librarian: Quest for the Spear and 2006's The Librarian: Return to King Solomon's Mines. Plot: A restless Flynn attempts to assimilate back into his career as a librarian at the New York Metropolitan Library after many adventures abroad. Led to New Orleans by strange dreams, he finds himself in the midst of uncovering a conspiracy that involves the notorious Vampire Prince Vlad Dracula. Once again, Flynn must overcome his fears and protect one of the world's most sacred artifacts, the Judas Chalice, or face the consequences of it falling into the wrong hands. My family was excited that we got to review the Third Installment of TNT's Librarian Franchise THE LIBRARIAN : CURSE OF THE JUDAS CHALICE . The whole family really enjoyed it. My older boys which are 13 &9 said they can not wait to see the first two installments that we missed. LIBRARIAN : CURSE OF THE JUDAS CHALICE will premiere on TNT Sunday December 7th at 8(et/pt) . TNT will air the first two installments The Librarian: Quest for the Spear & The Librarian: Return to King Solomon's Mines starting at 4pm(et/pt) leading up to the premiere of LIBRARIAN : CURSE OF THE JUDAS CHALICE. This a must see family movie !